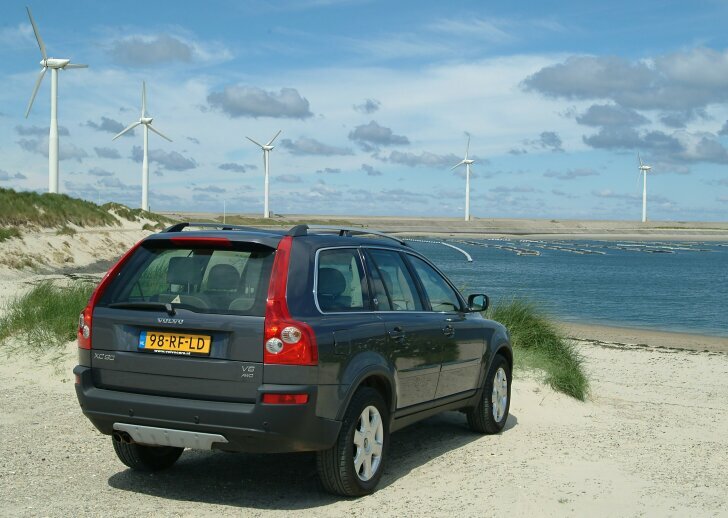 Review | Volvo is not only doing well in Europe. Also oversees the Swedish product is a sales success. In America Volvo is "European Chique" and therefore much sought after. That is partly the reason why Volvo introduced an SUV about 3 years ago. To accommodate the American customer's wishes better this car is now also available with a V8. For a long time was uncertain whether or not this muscle man would also come out in the UK, but now the car has definitely arrived. As opposed to American SUV's Volvo's example is not a well-dressed all-terrain vehicle. On the contrary, the XC90 better resembles a robust and rather large estate car. "Large" in this case is to American standards. The result is that in this country the car only just fits a parking space. When changing lanes on the motorway looking down wouldn't be superfluous to make sure that no cars are overrun. With sizable exterior measurements there should logically also be a good size interior. For this top version this is not only very spacious, but also most luxurious. All 7 seats (the standard car is available with 5 seats) are upholstered in leather. The front seats are heated and equipped with electrical adjustments with a memory. Sitting in them is absolutely formidable. The headroom is limited though, for even in the lowest position, the 1.9 metre tall test driver almost touches the roof. The space on the first backseat is more than enough for adults. Thanks to the built in cinema (optional) and extended aircon, the passengers in the back are supplied with all possible conveniences. Because the backseat is placed on rails (each of the three parts can be moved separately), with a little consideration enough room can also be created for adults on the second backseat. In practice it will probably only accommodate children though. This second backseat also has full headrests and safety belts, which provide all the safety Volvo has to offer. A full size MPV offers more space, but the difference is small. If so desired both backseats can be folded, which leaves a sensationally large luggage space. Thanks to a flat floor and a rear door that opens in two parts, this space is very useful and accessible. 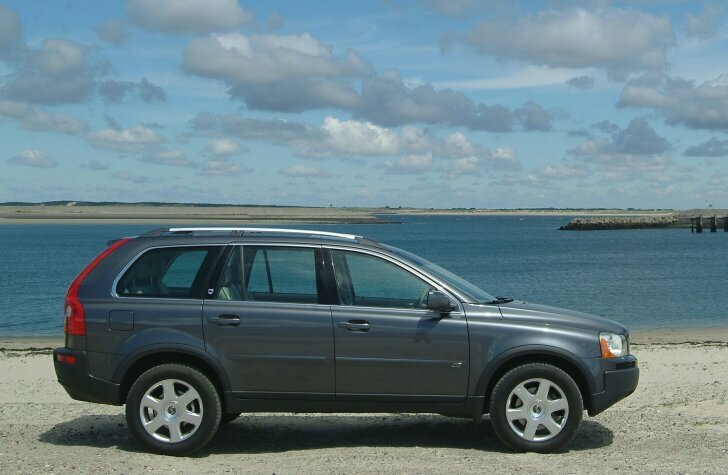 As mentioned before, the XC90 doesn't look like an all-terrain vehicle, but more like a high estate car and that is also what it was meant to be. Despite the 4-wheel drive and the "Instant Traction" system the off-road capabilities are limited. 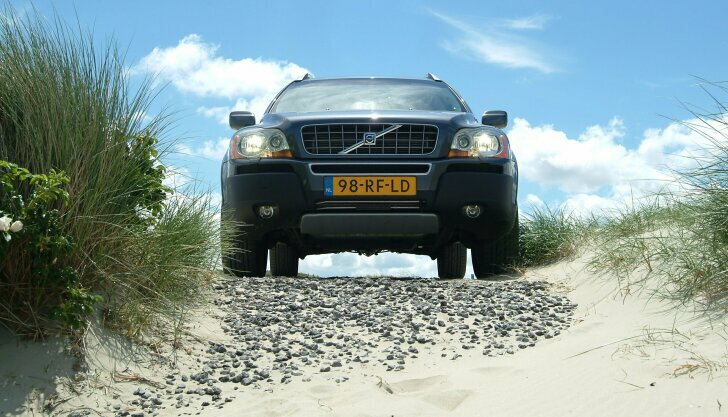 The tyres are not suitable for off-road driving, underfloor clearance is limited and low gearing is not available. On top of that, the XC90 with V8 engine is so extremely fast, that the car would bury itself in the ground with a little too much acceleration. Whoever has a good feel for the "Geartronic" automatic drive, can use this excess of power to bring the car in a spectacular 4-wheel drift and keep it there. But this 4.4-litre muscle man is not meant for this kind of extravagance. This top-version of the XC90 is meant to be the ultimate touring vehicle that not only offers an overwhelming amount of luxury and space, but also impresses with a sublime performance, which is achieved with great ease. The V8 is adjusted in a way that makes the car hardly audible from the outside. Inside there is only the sound of a deep distant growl. Only at full acceleration is there an outburst that sounds like a wild animal has just been released. It takes a while before this growl is heard, because between putting the foot to the floor and full acceleration it takes a short "time to consider" to thereafter achieve an overpowering performance. At these moments the XC90 never feels like a wild sports car. Thanks to the low sound levels and the effect of the high seating position the serene calm of a limousine prevails. Whether the car is in city traffic or the motorway, the XC90 feels like it is the only real car between just pedestrians. From this mastodon other cars seem small, slow and fragile. In city traffic the Volvo-driver is paying a high price for this, because fuel consumption at best is 11.4 mpg. On country roads 28.3 mpg is only just achievable. Although more stops at petrol stations than desired were needed, distances seem shorter in the XC90 than in many other cars. Volvo recommends the XC90 mostly as a versatile car. This is not achieved by making adjustments to an existing model, but to make a whole new one. The XC90 is not an all-terrain vehicle, but does have the space and the technology of one. At the same time this SUV has the practical aspects and the road holding of an estate car. Especially the latter is one of strongest points of the XC90. The test vehicle is the "V8 Executive", which makes the XC90 into a remarkably comfortable, luxurious and most of all very fast touring vehicle. However, this comes at a high price, if not its purchase then certainly in fuel consumption or road tax. Fortunately the XC90 is available with a more economical diesel engine for the European market, because the concept is sound.